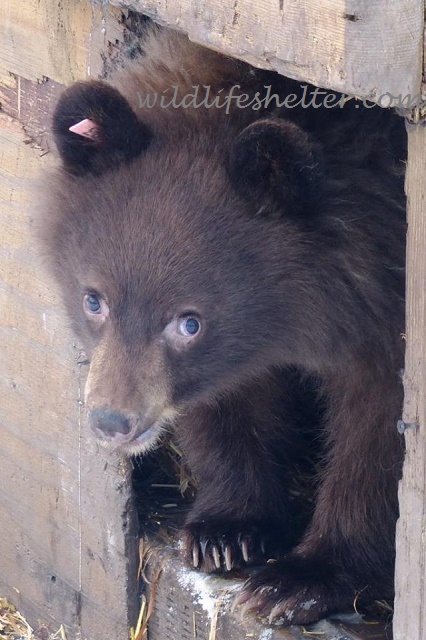 “Do you want to be friends with me?” is an emotionally charged question not just for humans, but orphaned bear cubs as well. It presents itself as soon as the newly arrived little bears at Northern Lights Wildlife Shelter can be released from the quarantine cages into larger enclosures and the company of other cubs. Normally black bear cubs stay with their mother until they are a year and a half old. That time has been cut much too short for the animals in care at NLWS. 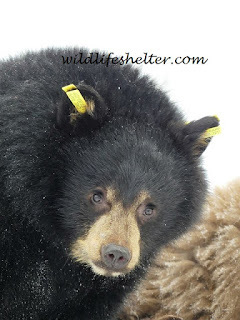 Being with other bears can help the cubs over the trauma of having been orphaned, often due to vehicle accidents, and finding themselves in human care. The bears here have lost their mothers and siblings, but at least they can find solace in their new foster brothers and sisters. Making friends takes time, though, and isn’t easy. I can’t help but smile as I watch Huck, the black bear cub who was very sick back in October and has since fully recovered, sit down on his haunches next to Holly’s den box, careful not to block the entrance. He gingerly stretches his neck until he can peek around the corner into the box. Holly sticks her nose out a few inches, and Huck immediately lowers his head, averts his eyes and draws back. 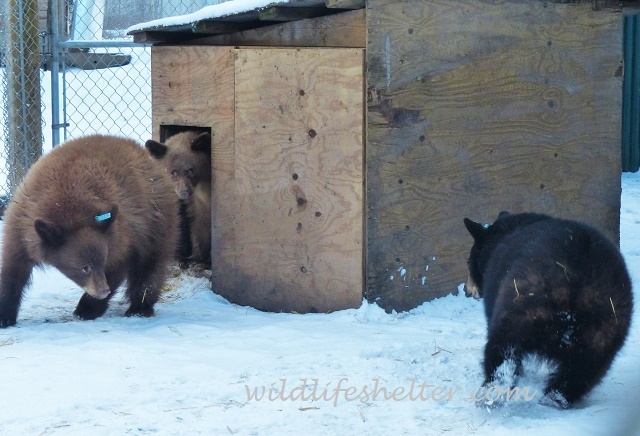 Holly does the same inside her den box, and a few seconds later Huck slowly peeks into it again. No angry growl comes in response, but as soon as Holly pokes her head out, Huck pulls away a little bit again. The two are gently probing how closely they tolerate each other’s presence. Holly is the smallest bear in this group of seven cubs, but size doesn’t automatically dictate rank among the cubs. It’s all about attitude and posturing. After we put out the food and leave the enclosure, my fellow volunteer and I watch the bears for a few minutes from the other side of the fence. mate Dill (we call him “Mr.” Dill because of his serious demeanor) prefers the latter: he stakes out a spot right in the apples and pears and grumbles a threat that sounds uncannily like “nyum, nyum, nyum” whenever a bear outside of his circle of friends approaches. Combined with hunched up shoulders and a tense body stance, his growl keeps two much bigger bears away. Huck, on the other hand, prefers the grab and run strategy. The problem is that in order to grab a piece of food, he has to first get it. Trying to look as inconspicuous as possible, he delicately takes one step, then another, using Holly’s den box for cover from the biggest bear of the group. But the big bear, who interestingly doesn’t dare approach Mr. Dill’s feeding spot, has already taken notice of Huck and is fixing him with a challenging stare. Huck freezes in his tracks and quickly checks if he can beat a fast retreat. This is not enough for the big bear: he pulls up his shoulders, lowers his head and takes the first fast steps to bluff charge Huck who now whirls around and runs for cover. But as soon as the big bear has grabbed an apple and left the feeding area, Huck sneaks out again. This time he is successful and runs off with an apple in his mouth, his head held triumphantly high. Will Huck’s striking up a friendship with Holly mean that her den mate Mr. Dill accepts him as a buddy as well? I can’t wait to see.